Content Management Systems (CMS) were created to solve this problem. A CMS allows a person, who doesn’t possess programming skills, to update a website (i.e. create pages and make changes to pages). This can greatly reduce the cost of maintaining a website. If your CMS is open source (WordPress, Drupal or other), you are not stuck with your web developer, there are thousands of other developer familiar with these CMSs ready to help you. Ability to update your website from any computer using a browser without using your web developer. Plugins or add-ons for adding photo galleries, calendars, tables, forums, membership only sections, selling items, etc. So if you’re tired of paying your web designer every time you want to make a small change to your website, you should look into converting your site to a CMS. Many CMS website designers can keep the look and feel of your current website if that’s what you like. Is Your Website’s Navigation System Important? Many websites have bad navigation (menu) systems. How many times have you found a site on google, clicked on the link and been taken to a beautiful website, only to discover that you can’t find anything on it? Some websites look like their menu system was an afterthought with no rhyme or reason. A beautiful website with good SEO is wasted if visitors to the website can’t find what they are looking for. Website navigation has become so important that it is now an area of specialization called “Information Architecture”. While many small businesses don’t have either a website or budget large enough to warrant the hiring of one of these specialist, their website designer should be aware of the navigation system’s importance. At the very least, you should ask a few people to look at your website and try to find something. If they have trouble, you should probably rethink your navigation system. 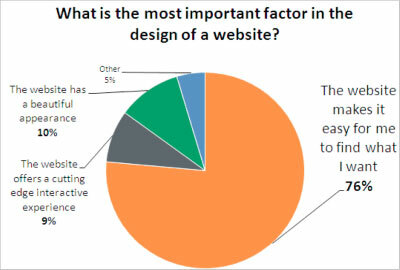 Your website’s ease of navigation is extremely important. If visitors to your website can’t easily find what they are looking for, they will go to your competitor. So don’t let your navigation system be an afterthought. One of the best things about internet marketing is that it can be measured. You can actually “see” whether or not you are getting results. So, that begs the question: Are you getting results? Surprisingly, many businesses don’t know if their website is really working for them, they just know that it “looks pretty” and that they get “compliments” on it. This is known as the “spray and pray” marketing method – put something up and pray that it will work. If you are basing your marketing on how things look on the surface, you may be missing the point. It is like finding a great looking dress or nice looking suit. It may look great on the hanger but once you try it on, you find that it is poorly made. The fabric is shoddy or the fit isn’t right. Just because it looked great, doesn’t mean it will work. Don’t spray and pray, do it right and get results – which in the case of most businesses, means more leads and customers.